Using a sharp knife cut the Pork fillets into 2cm medallions brush with oil and season with salt & pepper. Thread 3 – 4 medallions onto each metal skewer. Pre –heat the griddle plate or BBQ 3 -4 minutes on a medium high heat. Cook Pork kebabs 4-5 minutes on each side. Allow kebabs to rest 3 -4 minutes prior to serving. 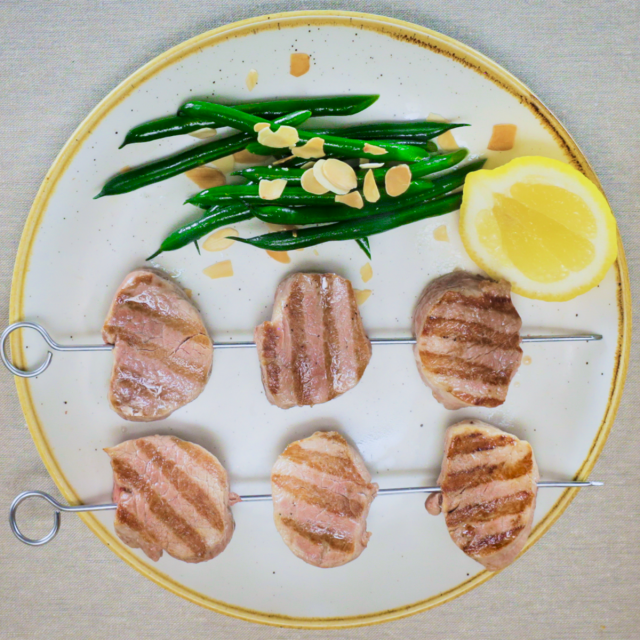 Serve kebabs with buttered green beans with toasted almonds. Garnish with lemon cheeks. Notes: These kebabs may also be sprinkled with your favourite seasoning prior to cooking.